It’s the last open race meeting of the year at Romford tonight and with thirteen opens on show from 6.27pm there is plenty to enjoy. With the Coronation Cup over 575 metres starting next week there are as ever interesting dogs making their six bend debuts. As ever I’ve endeavoured to find out more about one of them along with another making his four bend debut for your enjoyment. Slaheny Star is making his Romford race debut for trainer Keith Crew in the winner of one standard at 7.49 tonight over 400 metres. The son of Rio Quattro and Sierra Zorro has had a sprint trial over 225 metres at Romford back in June so does have track experience. On that occasion the October ’16 whelp clocked a decent calculated time of 13.80. Last month he won his first open at Hove over 285 metres and for his last four races has tackled Central Park over 480 metres to no avail. In those races though he was up against top class opposition and still managed to finish second three times. He feels a bit in between distances at the moment and 400 metres could be ideal for him. Trainer Keith Crew on Slaheny Star said: “He is owned by John Coleman and we were looking for a race for him. He has been around Romford before over two bends in a trial but injured a toe and was out for two months. He is a bit short of being open class but is a top grade dog. A bit in between. “Being in trap four is not ideal as he sticks to the rails like glue and likes to cut in. He is very head strong and will try to get over. If he gets out the draw could be problematic. If he doesn’t get out that may work out better as he can negotiate his way to the first bend better. Bet365 are offering 2/1 for Slaheny Star to win on his Romford race debut. Followers of the open scene will know Noelles Phelpso. Trained by local handler David Mullins, the December ’15 whelp made the quarter final stages of the Greyhound Derby this year and tonight makes his six bend debut. Contesting in a maiden stayers race at 8.21pm over 575 metres the son of Tyrur Big Mike and Noelles Swiftco will be looking to shed his maiden stayers tag at the first time of asking. He is in decent making the semi final stage of the Olympic at Hove recently over 515 metres. If able to stay will surely figure next month during the Coronation Cup. Trainer David Mullins on Noelles Phelpso said: “We are not sure if he will get the trip but he has shown tendencies to be a strong runner. I think he will get it. I’ve not actually tested him but will be a serious dog if he gets it. Friday is his big test. Bet365 make Noelles Phelpso a 5/2 shot to win on his six bend debut and are 8/1 for Pantone Slippy to win her puppies only race at 6.44pm. Regular readers of this column may well have had two winners last week courtesy of local handler Phil Simmonds. First up was Miss Boley who made her six bend debut last week and duly obliged as a 5/4 winner. Simmonds stated last week “….If she’s going to win over 575 metres it will be on Friday.” He wasn’t wrong. He also suggested from all of his runners last week that Grays Cup Winner had the best chance of them all. 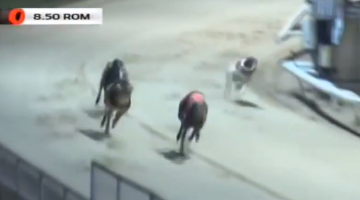 Again he wasn’t wrong when the Romford Puppy Cup winner scooped up by 2 ½ lengths in an impressive winning calculated time of 23.83 at a returned SP of 5/2.